The main reason this series is so fun is because it's just so different than all the other paranormal books. And its main character, Dante Walker, is one of the most wildly unique, hilarious protagonists ever. Victoria Scott is so talented at creating original stories with unforgettable characters, especially in this book. In fact, I think The Warrior might be my favorite out of the trilogy! Everything about this book was perfect: characters, plot, action, pacing, romance. There was hardly a thing I disliked, and it's not often that I read a book like this that I just want to gush over. But I'm still so blown away by how amazing this book was that I can't help it! I just love all the characters. I'll admit I was a little nervous going into this book that I would forget all the minor characters, but it was easy to remember them. I love all the varied interactions and relationships between the characters, and not just the romance. Yes, Dante and Charlie are adorable, but I also loved the deep friendship between Dante and his best friend, Max, as well Dante's friendships with Anabelle and Blue. It was just so sweet to watch how all the friendships and romances grew. Although, admittedly, my heart was totally broken by some events that happened at the end of the book. The romance takes a backseat in this book since there's so much plot development, but that's not to say that it isn't present. In fact, there's several romantic storylines scattered throughout the story, and I quite liked that. Even though Dante is the only narrator - and even though he's quite sarcastic - the cute moments between characters such as Anabelle and Kraven, and Max and Valery, were added in perfectly. And of course, Dante and Charlie remain an adorable couple. Dante is so protective of her, but I love how by the end of the book, he learns how to let her fight for herself and be her own person. The plot blew me away with the detailed world-building and suspense. There's never a lack of action, and the big battle and showdown at the end does not disappoint. Not only did I love the action scenes, I love how Victoria Scott holds nothing back. She's not afraid to let characters get hurt. *sniffle sniffle* Plus, there are a couple fantastic twists, seeing as how Dante and the others must decide who can be trusted. The first twist completely blindsided me - it was so shocking and painful that I couldn't believe it. The second one, I kind of saw coming, but I still felt the emotional impact. Scott is so good at making you invested in the story so that you feel everything the characters are suffering. And the ending was just great; that epilogue wrapped up the series perfectly. I've enjoyed this series so much. It's guaranteed to make you laugh and cry, and you'll be completely wrapped up in the characters' journeys. 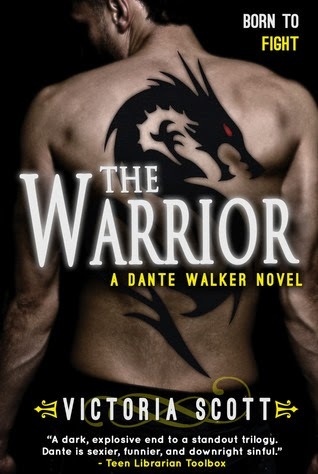 I'm going to miss Dante Walker and the rest of the gang, but I'm so glad I got the chance to read this series! You don't want to miss out on this addictive series.